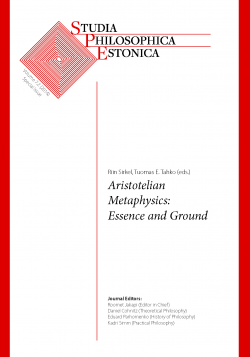 This special issue of Studia Philosophica Estonica centers around Aristotelian metaphysics, construed broadly to cover both scholarly research on Aristotle’s metaphysics as well as work by contemporary metaphysicians on Aristotelian themes. Aristotelian metaphysics is a growing tradition. The contribution this special issue makes to the ongoing discussion is twofold. First, it promotes a deeper interaction between scholars of Aristotle and contemporary metaphysicians. Second, the special issue is unified in its focus on two themes in Aristotelian metaphysics, essence and grounding. The papers address questions concerning fundamentality and dependence, ontological independence or priority, the causal priority of forms, the unity of grounding, the reduction of grounding to essence, the unity of essence, the roles of essence, and explanation and definition. * Margaret Anne Cameron: Is Ground Said-in-Many-Ways? * Christine J. Thomas: Plato on Metaphysical Explanation: Does 'Participating' Mean Nothing?